This cleaner removes metallic, mineral particles that are larger than the pulp fiber to deliver high quality pulp and ensure problem-free pulp making. 1. High-density capacity delivers pulp with material density of 3~5%. 2. Simply input pulp into machine with equal proportion of clean water to clean material. 3. Stainless-steel construction ensures anti-corrosion, wear-resistance and durability. 4. Glass mixing tank for pulp and water allows easy monitoring. 5. The improved design removes 5~6% of high density impurities in pulp and 2~2.5% fine particles in pulp. The design is bases on the physical properties of centrifugal force with the power driven by the pump, which is rated 2~3.5KG/CM² to pull the pulp in. The pulp enters the drum from a sharp angle to form a whirlpool before entering the glass cone. The downward flowing pulp creates centrifugal force to push impurities toward the wall of the glass cone to separate pulp and impurities. The pulp flow then flows to the upper exit with the impurities going downward to the waste tank. 1. Switch the valve to "Exhaust," shut the gate valve and open the cap of discharge pipe to clean impurities. 2. Close the cap of discharge pipe and inject clean water through water tube to wash the waste tank. 3. 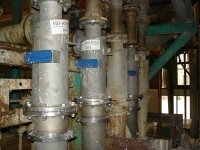 When water exits from the air exhaust hole, open the gate valve and switch the valve from "Exhaust" to "Water Supply". 4. Adjust high pressure water flow to balanced level to complete operation. 5. Auto process may be adopted for discharging impurities to eliminate need for manual control.